Hoooooowdeeeee!!! Queen Beatrice (that’s her with the red and gold crown and sparkly gold wings) is on her way with her entire entourage of hot honeys (hive and all) to Boonesville, Mississippi today for some tea, honey, and, hopefully, a little match makin’ with Uncle Beeford Bumble’s boy bees. Truth be told, I think Uncle Beeford is a few bees short in his beard and is up to some wiley tricks, but my girls are quite buzzin' saavy and know how to take care of themselves. What? You wanna know why they have red noses? Well, it seems some of the other tea partiers (names will not be mentioned to protect those with innocent-looking faces) stopped at Queen Beatrice's hive the night before for a little hive-gaitin' party and were dippin' into the sauce that Uncle Beeford sent to da Muddermark. This is his own special sauce from his distillery in Boonesville, Mississippi. Needless to say, they got a little schnockered before take off. So grab your bees, your honey, your netting, and whatever else you want to bring to the shindig tea party in Boonesville today cuz we are gonna have a rootin’ tootin’ good time! If ya’ll need more details as to the full story and/or what you need to do to participate, you kin check it out on da Muddermark’s blog. If yer uploadin' her buzzin' creations to Splitcoaststampers, be sure to use keyword MMTPT59! I hope to see you there! The buzzin by beauty bees were colored with Copic markers. Each precious bee was hand cut and adhered to their hive. 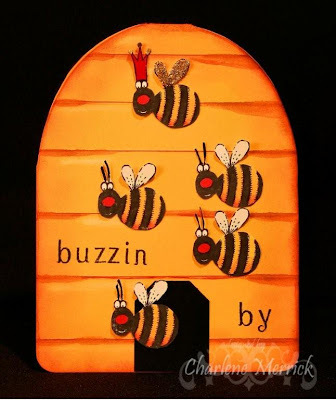 Their buzzin' hive was shaped with a Coluzzle oval cutter and scored with a Scor Pal. Color and shading were added by sponging the various colors with daubers and watercoloring with SU reinkers and watercolor brush. Charlene, this card is a riot! I think you must have put something 'funny' in your morning coffee!LOL! You sure enjoy teapot tuesday, and the rest of us do vicariously through you!! I love these bees, and you hive!! Great job!! Love your schnockered bees Charlene! wonderful hive and Queen! This is just so cute, Charlene!! I love the bee hive and the adorable bees!! Oh my goodness I love those bees. Great job with the hive and the queen bee too! I love your Bees Charlene!!! What a great hive!! Your posts are always so much fun to read!! Charlene, this is just too adorable...you girls have too much fun! You have some mighty fancy smancy little bees there, Charlene...they will cause quite a stir at the tea party, for sure!!! Beefords 12 little boys will be doing dive bombs around these beauties!!! Love every little detail on this, gf...toooo cute!!!!! Darn it! I shoulda come to your blog days ago! I have spent the last few days tirelessly searching for some renegade Rudolf the Rednose Reindeer red nose thiefs and here they are! I am trying to be proactive so that Christmas is not cancelled! OMG! Bertie! This is about the cutest card on the face of the earth! Your bees are so precious and I had so much fun partying with you this week...well, every week! You go girl...you are getting embarrassing to hang out with! Snort! OMG, this is the cutest. How fun! Love those bees -- so cute!